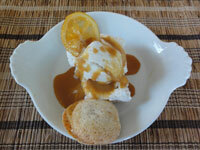 For a fabulous winter dessert, you can simply pour Meyer Lemon Caramel Sauce over vanilla ice cream; and if you want decorate with Candied Meyer Lemons and/or Almond Meringue Cookies sandwiched with Meyer Lemon Curd. Combine sugar and 1/4 cup water in heavy small saucepan. Stir over medium-low heat until sugar dissolves. Increase heat and boil without stirring until deep amber color, occasionally brushing down pan sides with wet pastry brush and swirling pan, about 8 minutes. 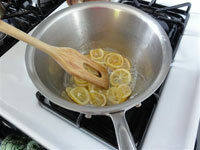 Carefully add lemon juice, zest, cream and butter (mixture will bubble vigorously). Stir over low heat until smooth and any caramel bits dissolve. Cool completely. Sauce be prepared 1 day ahead. Cover and let stand at room temperature. In a food processor, process the almonds until very fine. 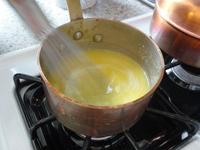 In the bowl of a mixer, beat the egg whites until soft peaks form. 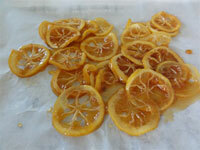 Slowly, tablespoon by tablespoon, add the granulated sugar and beat until stiff and shiny. 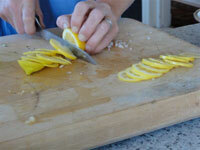 With a rubber spatula, fold the pulverized almonds into the egg whites. Using a pastry bag fitted with a 1/4 inch tip, pipe out 1-inch rounds 1 inch apart on the cookie sheets. Or use a tablespoon. Bake the meringues in the middle of the oven for 15 minutes, or until they are light golden in color. Working quickly with a spatula, remove the meringues to a baking rack. Let cool.